Argoon 18's Dark Matter is a fast dirt road bike with a longer front center for stability. The dropped chainstay makes for an exceptionally short rear while still allowing bigger tire clearance. Fork: Dark Matter carbon disc. Headset: FSA 30 + 3D Plus. Brakes: SRAM Force DB, 160/140 Centerlock rotors. Crank: SRAM Force 1 Xsync 42T. Bottom Bracket: SRAM BB Press Fit GXP. Rear Derailleur: SRAM Force 1. 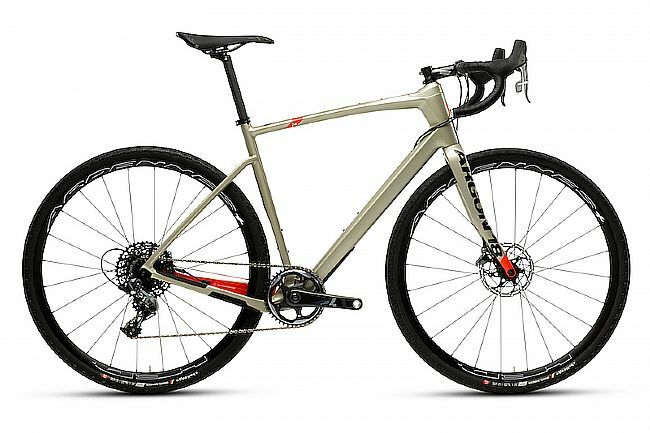 Tires: Challenge Gravel Grinder 42c. Stem: FSA NS OS-96 alloy. Seatpost: Argon 18 TDS-C carbon. Saddle: Prologo Scratch RS T2.0.